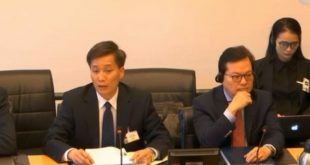 PARIS, 4 September 2018 (VCHR & FIDH) – The draft report prepared by the Vietnamese government for the country’s upcoming Universal Periodic Review (UPR) suppresses grave human rights violations and deliberately misinforms the international community, FIDH and its member organization Vietnam Committee on Human Rights (VCHR) said today. The third UPR of Vietnam will be held on 22 January 2019 at the United Nations (UN) in Geneva, Switzerland. “In its current form, the government report for the UPR shows Hanoi’s inability to acknowledge ongoing human rights challenges and its lack of political will to address them. The government should take into consideration all inputs from civil society, particularly with regard to the abysmal situation of key civil and political rights, and ensure their concerns are reflected in its report for the UPR,” said FIDH Secretary-General Debbie Stothard. Since Vietnam’s previous UPR in February 2014, authorities have intensified their repression of civil society and government critics. Between February 2014 and July 2018, FIDH and VCHR recorded the arbitrary arrest or imprisonment of at least 160 human rights defenders and peaceful activists. In a report jointly submitted for Vietnam’s upcoming UPR, FIDH and VCHR raised numerous human rights issues of concern and made recommendations for improvement. “The government report for the UPR is full of statements that defy reality and mask the fierce repression of civil society that has drawn strong criticism from the international community. In a country where democracy is synonymous with subversion, the government report’s claim that the Communist Party of Vietnam is promoting democracy is surreal,” said VCHR President Võ Văn Ái. The government says its draft report, which is currently posted on the Ministry of Foreign Affairs’ website, covers human rights developments in the country since its second UPR. Below is a brief analysis of the draft report’s main shortcomings. Paragraph 46 states that the new Law on Belief and Religion (which came into effect in January 2018) and its implementing decrees lay “a solid legal foundation to better ensure freedom of belief and religion for the people.” On the contrary, this law is inconsistent with Article 18 of the International Covenant on Civil and Political Rights (ICCPR), to which Vietnam is state party, which guarantees the universal right to freedom of religion or belief. Under the Law on Belief and Religion, state recognition of religious groups is mandatory. Authorities must be notified in advance of all religious activities and may prohibit them without explanation. New decrees impose heavy fines on non-authorized religious activities. Since the law came into effect, authorities have increasingly harassed non-registered groups, such as the Unified Buddhist Church of Vietnam, Hòa Hảo, and some ethnic minority Protestant groups. Paragraph 37 states that the Criminal Procedure Code ensures that trials are fair, the rights of persons held in custody are protected, and detainees are not forced to make confessions. In fact, the amended 2015 Criminal Procedure Code provides for virtually indefinite pre-trial detention in “national security” cases, in violation of international law. In addition, the Criminal Code allows for trials involving “national security” to be held behind closed doors. Prisoners are routinely detained incommunicado and subjected to beatings, which have led to frequent deaths in custody. On 16 August 2018, activist Lê Định Lương was sentenced to 20 years in prison on the basis of forced confessions made by bloggers Nguyễn Văn Hóa and Nguyễn Việt Dũng. According to Lượng’s lawyer, both men said they were beaten in prison and later retracted their statements, but their confessions were nevertheless used by the prosecution as incriminating evidence against Lương. Paragraph 34 states that then-UN Special Rapporteur on freedom of religion or belief Heiner Bielefeldt “noted the efforts and achievements of Vietnam” during his official visit to the country in 2014. This is a serious misrepresentation of the facts. In his report on the mission, the Special Rapporteur said he was “deeply concerned and outraged” by intrusive police surveillance, harassment, intimidation, and physical assaults against members of non-recognized religious groups who sought to meet him, causing him to cancel several field trips. Mr. Bielefeldt said these incidents violated the terms of reference agreed upon by the Vietnamese government.